The LRTP would like to thank the Honorable Norman Silber for his interesting and informative talk. We join in your disgust that so many supposedly Republicans consistently join Democrats to oppose traditional Republican principles and the NH Republican Party Platform. You might want to ask your representatives why they voted this way if they show up on any of these lists, if they show up multiple times, you might want to try to replace them in the legislature. Representative Silber’s handouts show the Republicans who voted against Republican principles/positions on several issues. These Republicans voted AGAINST the Right-to-Work bill. These Republicans voted to EXPAND Medicaid. These Republicans voted FOR a gender identity special rights bill. These Republicans voted to ALLOW gender re-assignment surgery for minors. These Republicans voted to ALLOW Medicaid to continue to pay for gender re-assignment surgery. 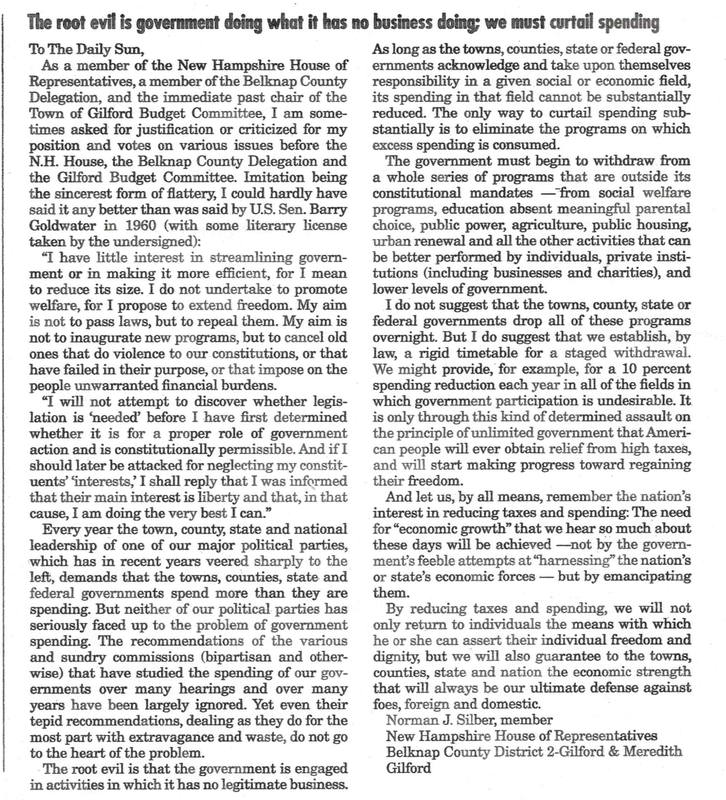 And here is Rep Silber’s excellent letter to the editor in the Laconia Daily Sun on March 21. We also watched an excellent 17 minute video entitled, “The Fall of Rome and Modern Parallels”. If you have not seen this, I strongly recommend that you watch it. It seems to me that one of the reasons our country is in so much trouble is that we have forgot to recognize and reinforce the importance of the traits that enabled Americans to prosper, live free, and have such a benevolent society. I think we need to re-identify those important traits and start talking about them again. I’d like to have a group discussion of this at a future TEA Party meeting.